We custom mix our inks for each job. 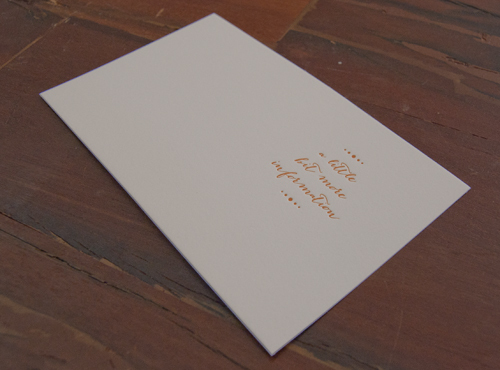 Our presses are really efficient and we use less than a tablespoon of ink for a set of note cards. A little goes a long way as the inks are like a thick paste. When mixing, we start with some base colors that we combine, often with the addition of black or white to tone down the saturation. 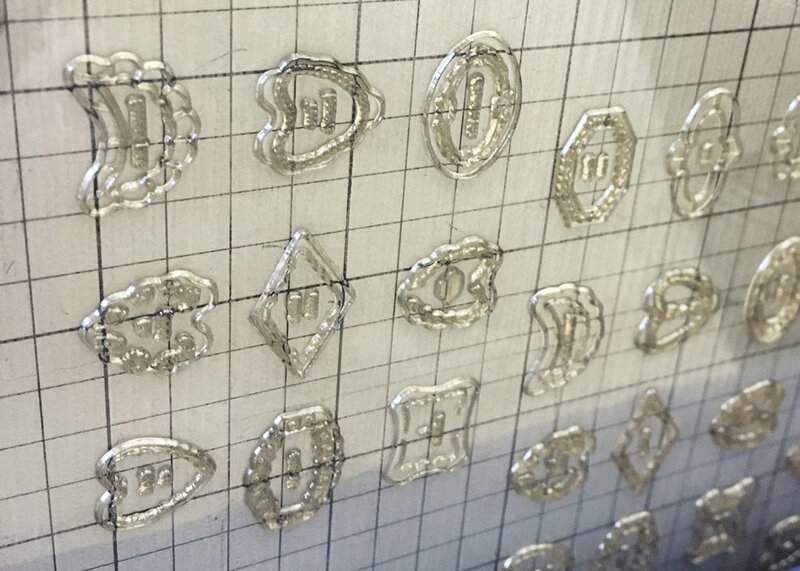 We frequently get requests for tinted embossing. We add a drop of gray ink when we print embossings to give the imagery a bit more of a shadow. The result is subtle, and beautiful when paired with a deeper color. If you're looking for a subtle image to accent your custom stationery, we recommend printing in a blind emboss like these images illustrate. Generally, we use a touch of pigment in a clear ink to help give the image a bit of shadow on the paper. The result is a beautiful bit of texture that allows your text to stand out, while giving the design a bit more depth. We don't recommend doing a blind or tinted emboss for text, as it is not reliably legible. 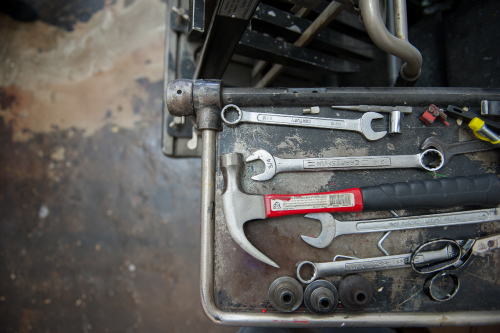 We share a lot of photos of the stationery we're printing so for a change, we've decided to step back and show some pictures of our studio and printing presses. 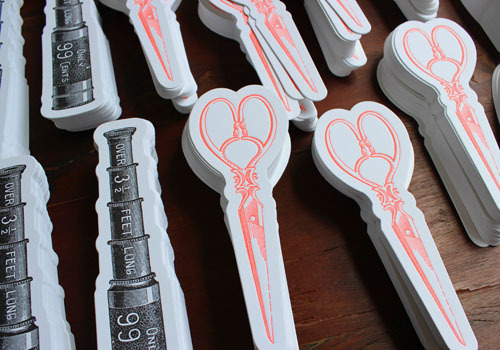 We do all of our own letterpress printing here in the Brooklyn studio. Doing this ourselves allows us to really pay attention to each piece that passes through the press and be certain that it matches the design we've created. It is important to us that our stationery is perfect as it has to represent the people who will be writing on and sending it. Having control in the printing helps us ensure this. Plus, we like making things and it’s immensely satisfying to start the day with stacks of blank paper and finish it with stacks of beautiful stationery! Here's a peek into the process of printing some floral save the dates for a fall wedding. These save the dates were printed as postcards, with a beautiful large floral image on the front and the necessary information on the back. 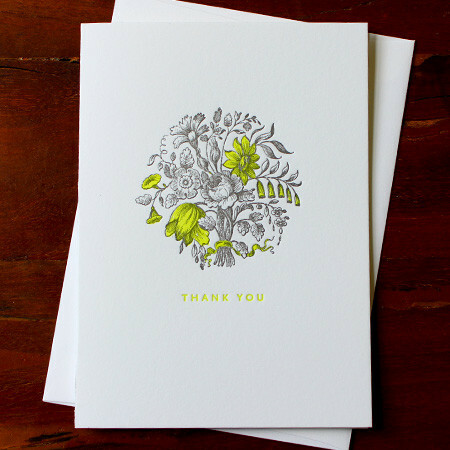 We printed the text in a wine red as, and a warm tint of gray for the large flower. It feels like the perfect color comination for an end of summer wedding at a vineyard. 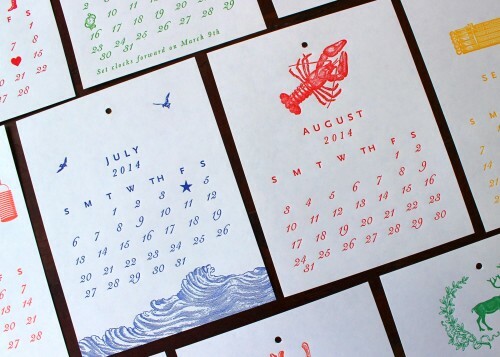 In anticipation of summer, we were itching to design something new for our wedding collection. We were inspired by some beautiful illustrations of green palm trees and leaves. 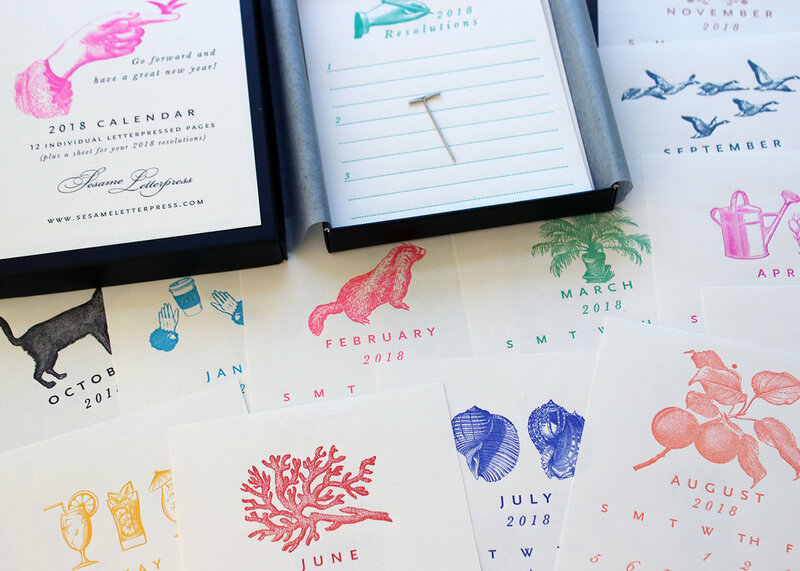 This letterpress suite is perfect for a destination wedding on a lush island (even better if you're lucky enough to live somewhere tropical!) The envelopes are a lined with giant green palm printed liners, and we added a pink flamingo belly band for a bright contrast of color. 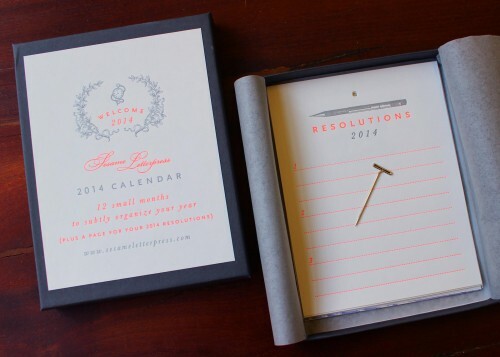 Its a fun design that also works well for a formal wedding. 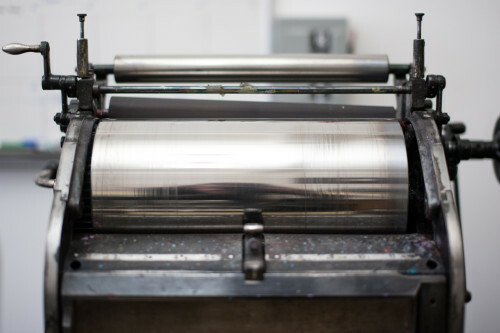 Take a look below to see a bit of the letterpress printing process. Check out more of our new wedding designs on our website! A very exciting printing job! 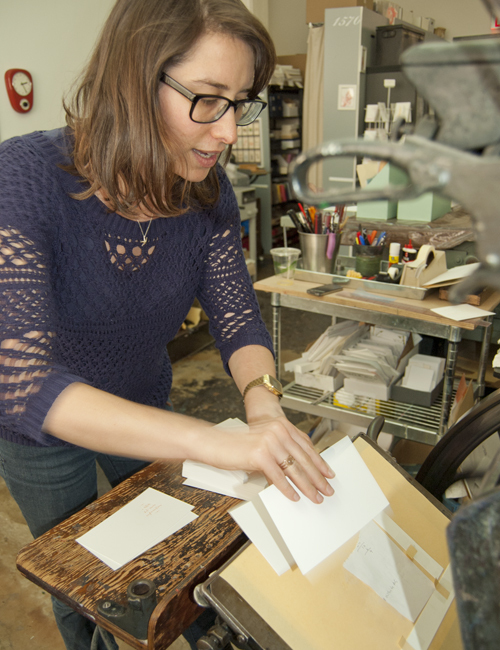 Today Kate has been printing the first color of a wedding invitation on our Vandercook printer. I'm more used to seeing her printing on the Golding Jobber so I was very curious to check out how the Vandercook works! 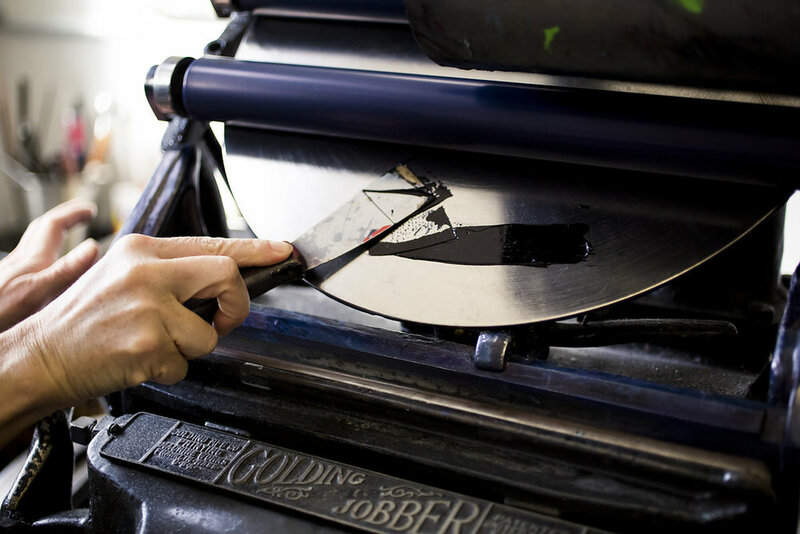 So, for any other letterpress enthusiasts out there, here's a little photographic step-by-step guide to how to print on the Vandercook. Then Kate ensures that the machine is in "trip" mode. This means that she can ink the rollers without actually printing onto the cardstock. The rollers are returned to their original position and Kate then switches the machine to "print" mode. 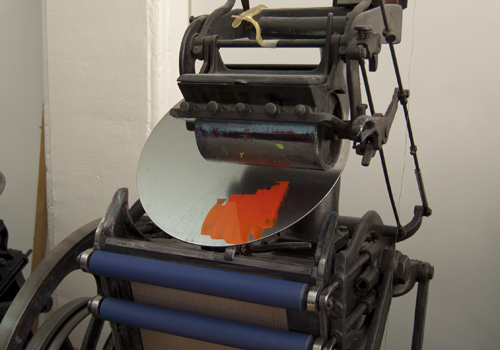 This enables the rollers to actually press into the cardstock and transfer the ink and the impression. And - voila - a finished piece (well, the first color anyway!). It really is amazing to see how many little movements and skilled elements are involved in printing just one color of one piece. 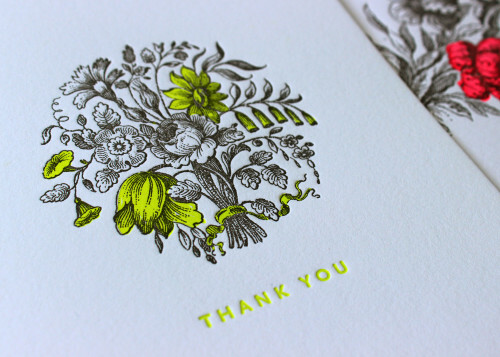 It really reminded me of the craftmanship of letterpress printing and the care and attention that goes into the process!